Wilmington: Hurricane Florence smashed into the US East Coast on Friday with howling winds, torrential rains and life-threatening storm surges as emergency crews scrambled to rescue hundreds of people stranded in their homes by flood waters. Forecasters warned of catastrophic flooding and other mayhem from the monster storm, which is only Category 1, but physically sprawling and dangerous. The port city of Wilmington woke on Friday to the sound of exploding electrical tran-sformers with strong gu-sts throwing street signs and other debris as well as water in all directions. 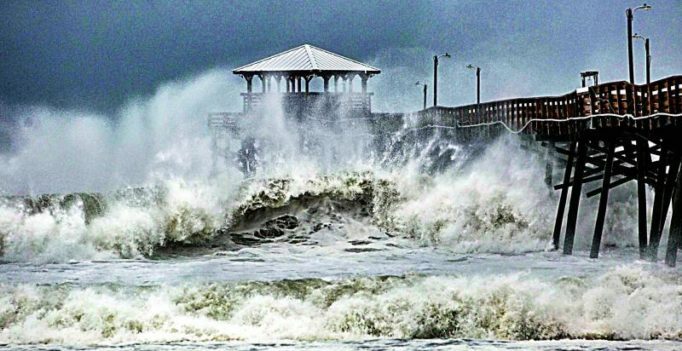 The storm made landfall near Wrightsville Beach, North Carolina at 7.15 am, the National Hurricane Centre said. Ken Graham, the NHC’s director, warned the slow pace of the storm exacerbated its danger even to areas outside its immediate path. “The longer you have this hurricane wind flow, the longer you push that water well inland,” he said. Rescue workers in North Carolina meanwhile were scrambling to save people stranded in their homes. Video footage showed parking lots in the riverfront town of New Bern turn into shallow lakes of dirty gray water as heavy rain fell. New Bern Police Lt. David Daniels said that between 150 and 200 people were rescued so far, with others still waiting for help.